Highlight trends with moving and tumbling windows. You can calculate continuous aggregation over a sliding time window using one of the moving window functions. Moving time window functions are useful if, for example, you want to calculate the moving average over the past 24 hours. But if you want to look at the daily average for each day, you have to create fixed-size time window. This page explains how use moving and fixed-sized time windows. The Wavefront moving window time functions allow you to calculate continuous aggregation over sliding time windows. Wavefront offers functions for creating moving windows on various aggregation such as msum(), mavg(), mmedian(), mcount(), etc. These functions create continuous moving or sliding windows which can be useful for looking at moving trends. For discrete time series, the moving windows recalculation is done every second. 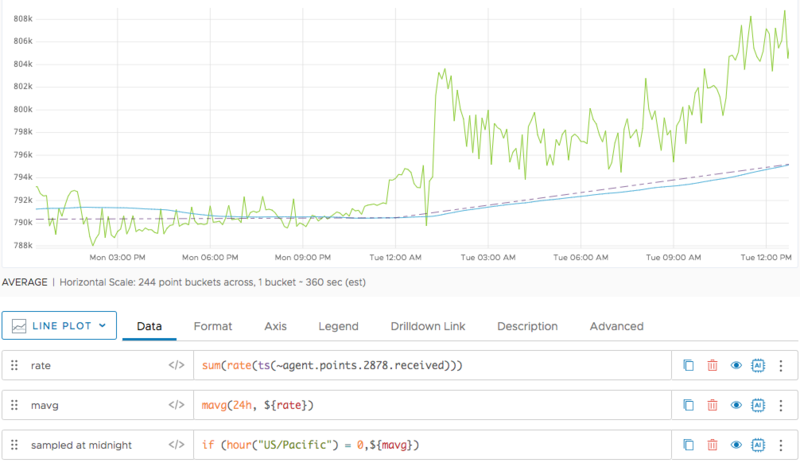 For continuous time series, the recalculation is done for every bucketing interval. 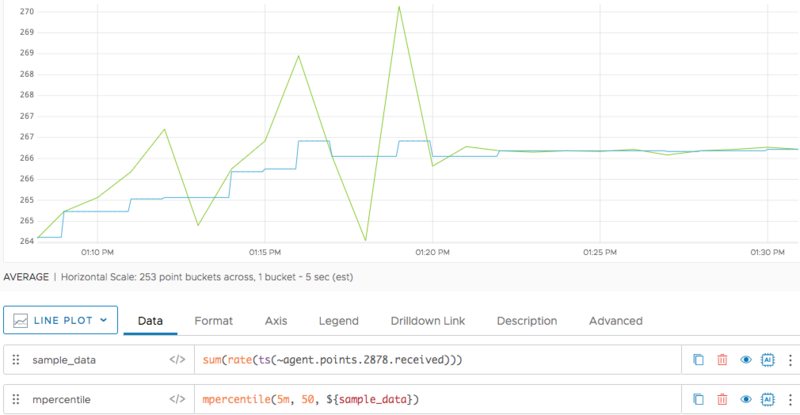 For example, if you have a 30 second bucketing interval, then recalculation happens every 30 seconds. The following chart shows the resulting continuous moving average over the past 24 hours. Record your metrics in these windows. We show some examples at the bottom of this page. These windows are commonly referred as tumbling windows. Tumbling windows are a series of fixed size, non-overlapping, and contiguous time intervals. 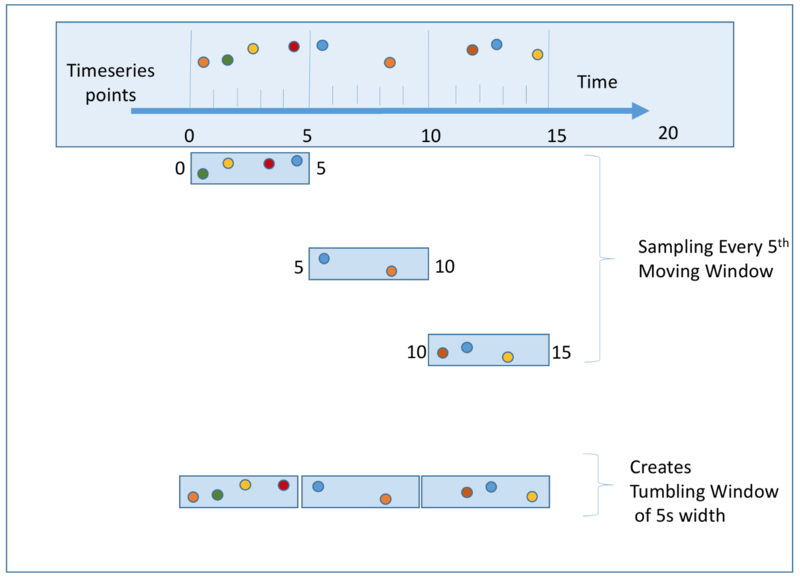 The following diagrams compare moving and tumbling windows. The following diagram illustrates how a series of points is mapped into 5-second moving windows. The moving window slides ahead one second at a time. New points are added at the front and the older points become invisible as the window moves ahead. The moving windows overlap. There are several common use cases for tumbling windows. We can use tumbling windows to get the average daily rate. We use the hour() function to sample the average every day at midnight. This results in the average for 24 hours, and we can display this average across the day using the missing data function next(). In the chart below, we show the data point sampled at midnight. the green circles show the sampled data. 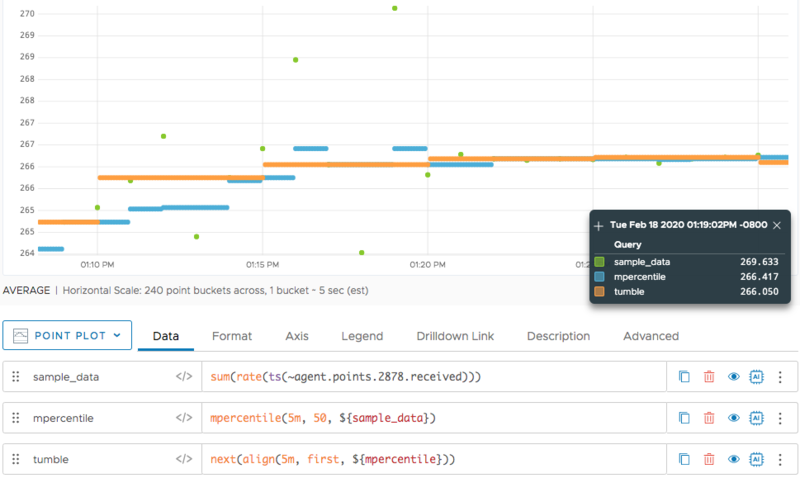 We use next() to display the information for the entire day, as in the following queries. The corresponding chart is immediately below. The following example shows the metrics reported to Wavefront by the Slack application in both the moving and the tumbling windows. The chart shows the count per day starting at midnight PDT. 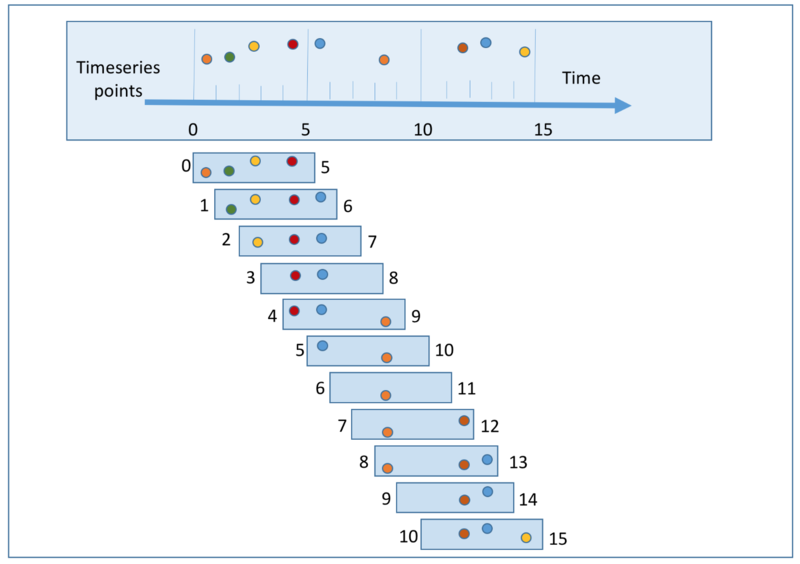 If the count per day is missing at midnight, the chart looks at the first value in count per day up to 12:30am, and uses that value as the value for the entire day. This example is similar to the daily average example above. However, instead of sampling the moving count exactly at midnight, we take into account any missing or delayed data and pick the first value of the 30 minutes past midnight. The next() function displays this value for the entire day. The following examples show how you can covert any moving function to a fixed or tumbling window by correctly sampling the moving window. You can use time functions the align() function, or both. In the following chart, sample data is being reported every 1 minute. For the same time series, we show a 5-minute moving percentile. The result is the 50th percentile point in the last 5 minutes. We display this point at every minute interval. If you want to find a 50th percentile of points in fixed 5-minute window, you can use align(5m,...) to sample, followed by next() to display the 50th percentile for the entire 5-minute window. The example uses align() instead of a time function. This example plots the raw data overlaid with the 5-minute tumbling window for the 50th percentile. 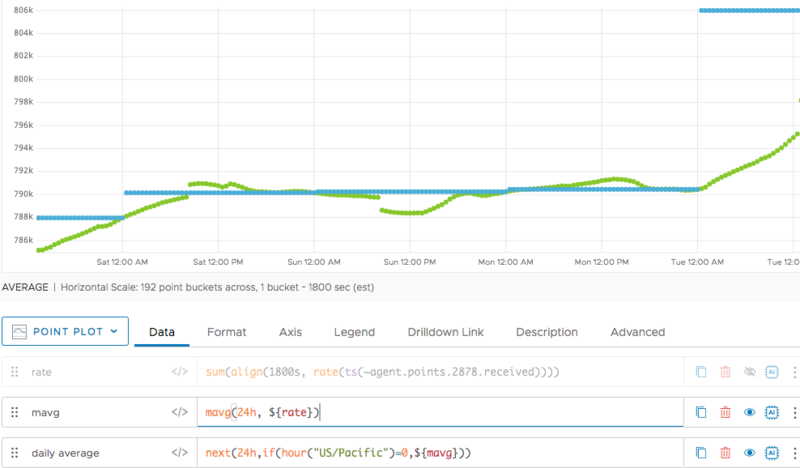 The orange line is the 50th percentile of points in every 5-minute fixed window. You can see how it coincides with the middle-valued point in that time interval.